All who are following this Mega Marathon, did you even once question as to why I’ve not featured a breakfast dish from my own country Kenya? Go on admit you must have. You must be wondering that if she can feature an unheard of country like Tatarstan then why not Kenya. Well, I was waiting for the right moment. Letter U got filled in first when I was compiling my list. I have already got the recipe of Mamri (mahamri). on my blog which a very popular breakfast dish in the coastal area of Kenya. Mamri is like having the typical Gujarati breakfast of ganthia jalebi. Mamri is served with dried pigeon pea or cowpeas cooked in coconut milk. I love having mamri and mbaazi as we call it. Another very popular and ultra healthy breakfast all over Kenya (besides the unhealthy fried sausages and chips) is Uji. Uji is nothing but porridge in Kiswahili. This porridge is nothing like the oatmeal porridge we all know. There are several ways of making this uji. Its pocket friendly, easy to make and popular amongst both the rich and poor. A mugful of uji and you wouldn’t feel hungry till lunch time. How can Uji be made? 1) Some take a mixture of cornmeal, sorghum flour and finger millet which is called wimbi in Kenya. 2) Some make it using only one type of flour. 3) Some make it by mixing either one flour or a mixture of flour with water and then allowing it to ferment for a few days. The mixture is then warmed up and consumed. 4) The most popular method nowadays is the quick method as mothers too have to rush off to work. Here the flour and water are mixed and added to boiling water and within 10 minutes Uji is ready. I know this is very similar to the ragi or malt drink that is prepared in South India. However, the difference here is what sort of flours are used. To get that sour taste in the quick method, its served with lemon juice and a bit of salt. For kids, when the uji is ready its topped with milk to make it into a more healthier and drinkable breakfast. I remember when I was nursing my twins, the maid I had employed to help me would make uji everyday for me. She would force me to drink a mugful as it was supposed to help me gain my strength back, help to produce more milk and good for the babies I was feeding. Initially I didn’t like uji but now its a part of my breakfast. I like to have different breakfasts so sometimes its Uji topped with chopped nuts and cinnamon powder or cardamom powder. Day 21 breakfast is the ever popular Uji from KENYA. Mix flour and ¼ cup water into a paste. Heat the remaining 2 cups of water in a pan over low to medium heat. When it becomes hot, stir it all the time and start adding the flour paste. Keep on stirring till the mixture becomes thick. You must keep on stirring it or else lumps will be formed. Let the mixture simmer for 5 minutes. Spoon the mixture into serving bowls or cups. Add sugar, honey or lemon juice and salt according to your taste. Usually uji is served plain but I like to add a bit more of healthiness by serving it with chopped nuts. Add spices like cardamom, cinnamon to the porridge. It can be served with chopped dried or fresh fruits. Another easier way to make the porridge is to first mix the flour and water into a paste. Then add the required water and mix. Heat the mixture stirring it all the time till it becomes thick. Interesting read Mayuri . A porridge with ragi must be so healthy , and this would be a great breakfast , specially new moms ! Well back years back we ate the regular porridge , but with time so much variation has come up . Thanks Vaishali. Somehow Uji still is an important breakfast dish for many in Kenya as its filling and cheap. Lovely find for U.. So interesting and now you have a wonderful collection of breakfast recipes!! Thanks Sharmila, yes I’m quite proud of my collection as I’ve tried to make traditional breakfast dishes for this BM. Wow, never knew before that ragi is used extensively in kenya !!! Ujji sounds so similar to the raji sweet kanji and adding lemon is quite unique as you said.Looks tasty, Great share,Mayuri. Sandhiya, I grew up knowing this millet as wimbi. its only when I started blogging that I realized that its called ragi in India. All these millets are super healthy but not extensively used by families. Uji looks absolutely nutritious and definitely filling. South Indians makes a similar version but as a savory one. And this sweet version sounds too good to kick start a day. Thanks Priya, sometimes we have it with some fruit added to it too. The savory one with lemon is also tasty. Good to know about Uji..quite interesting recipe too and I must say you have a great yummy & filling breakfast dishes list. I love to try few of them. Thanks Jolly, Uji is suppose to be very healthy and is also given to people who are sick. Try some of the recipes and let me know how they turn out. This is a very unique recipe for me. Uji is very knew to me and looks like a very healthy recipe. I will make it for my daughter. Thanks Nandita. It is a very healthy and filling porridge. You can add powdered nuts too and fruits too. Such a healthy option for breakfast, it must be quite filling to keep hunger at bay for long, interesting recipe. Thanks Soma, it does keep one full for a long time and for kids mothers add a generous helping of butter. Mayuri, this is a new recipe for me. I do make ragi porridge for its nutritional benefits. will try Uji next time. Thanks Sandhya, ragi and uji are quite similar. Never heard of this dish.. learnibg new stuff from you dear. Thanks . Interesting write up. Thanks Mayuri for introducing me to these new recipes. Never heard about uji. Sounds healthy. Awesome share. It is very healthy Sujata and its such a great nutritious and filling porridge even for people who are sick. Thanks Drashti, it is healthy and filling too. Lovely to read your experience about this wonder Porridge. Home Remedies are the best to get back into good health and esp after delivery, certainly more effective than what doctors could ever recommend. Such advise comes with years of experience and wisdom. A healthy porridge recipe that is excellent for kids and adults. You have made it look pretty delicious too with your styling and photography. Thank you so much Vidya. Though my hubby is a doctor, I do believe in certain home remedies. Was going through the entire A-Z, you have done a brilliant job here showcasing each recipe and the cultural background of the same. Thanks Lathiya, it is similar to ragi porridge. This dish is totally new to me, but now that I’ve seen the recipe I am going to make very soon as I love to incorporate grains such as millet/Ragi in our diet. Sounds delicious. Thanks Jagruti and do try it… its filling too and a comforting dish. Thanks Freda. And I will be checking out the Goan version of this porridge. Kenyan cuisine has its own traditional dishes and then those that are influenced by Arabic, Indian and British cuisine. We are all so different, yet so similar. Yes, the ambli of South India closely resembles Uji. I am yet to read all your posts of the Mega Blogging Marathon but will catch up soon. Thanks Aruna. As you said so different and yet similar. Yes it is similar Uma but since the poor people here cannot afford milk its usually made with water and for kids topped up with little milk. This is so much similar to koozh we make in Tamilnadu. Koozh is also fermented and makes a healthy breakfast. Nice to know that similar dishes exist in places which are miles apart. Yes its truly amazing as so many dishes are somewhat similar and yet different. It is a healthy option for breakfast and a great way to include millet in the diet Sasmita, try it . Thanks Avin..try it out and its so easy to make. Wow looks so interesting.. you have good.collection of international recipe. That is such a healthy and filling breakfast porrdige. Reading about the health benefits of ragi flour, I guess we should all include it in our diet. It is definitely filling Sapana. I like adding fresh fruits to it to make a wholesome meal. I didn’t know your kids are twins Mayuri – you sure must have needed lot of strength after delivery. This Kenyan Uji sounds very nutritious, filling and perfect way to start any day. Good choice for the letter U. This is surely a healthy one and much like our own versions..didn’t realise you have twins..:)..as always it’s nice reading your intros..btw do fix your internal links, the links are broken after the change.. Thanks Srivalli. Will look into the internal links. What a lovely recipe and it is always the best experience to learn from the locals. So glad that your maid introduced this to you and thanks to you for the recipe to help us now. 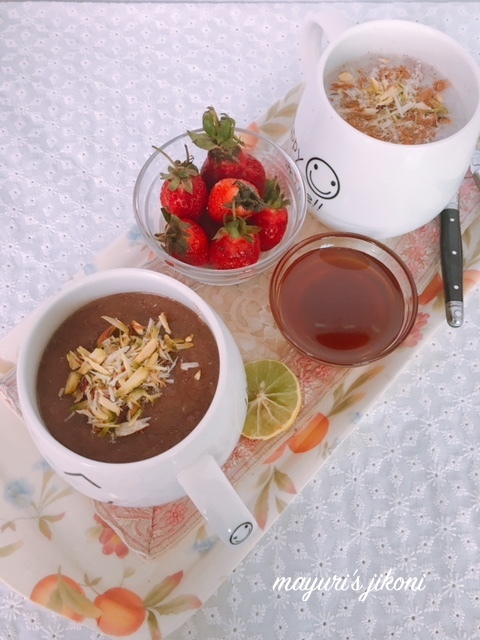 wow ragi porridge looks so inviting and such an healthy way to start a day .. Thats is so nice of you to learn it from your maid and sharing it here 🙂 looks so yummy !! Thank you so much Manjula. The forgotten recipe has been revived and now have it often. Mayuri, I came upon this dish sometime back when I was looking for recipes for one of the previous editions of BM.Since I was really not sure how it would taste, I din’t make it. Your pics itself says everything! Super dish ! Thanks Padmajha, it tastes a bit like ragi drink. I don’t like the fermented version that they make.